The National Assembly is under fire following revelations that politicians have been taking overseas trips funded by state organizations, as well as pocketing special activities funds. On Wednesday, the National Assembly said it would refer lawmakers suspected of having taken such illicit overseas trips to the ethics committee if irregularities are found. The announcement came after the state-run Anti-Corruption and Civil Rights Commission revealed in late July that 38 incumbent lawmakers were suspected of having received funds for such trips from entities under their supervision. Such actions would be in violation of the Improper Solicitation and Graft Act that went into effect in September 2016. Parliamentary officials, however, said that they would not disclose the names of the 38 lawmakers and the money they received, saying the institutes that provided the funds are likely to reveal them. The National Assembly Speaker Moon Hee-sang is reported to be included in the list. Three negotiating blocs at the National Assembly -- the ruling Democratic Party of Korea, Liberty Korea Party and Bareunmirae Party -- agreed Wednesday to launch a consultative group to review the business trips of lawmakers. While about 8 billion won ($7.16 million) is set aside in the National Assembly budget every year in the name of special activities funds, a civic group raised the issue that the money was allotted to ranking lawmakers and party leaders without requiring proof of how they were used. “We will abolish the special activities funds starting this year, and will create different categories for the fund to specify their usage from year,” floor leader Rep. Kim Sung-tae of the main opposition Liberty Korea Party said after their meeting. People’s Solidarity for Participatory Democracy, a liberal civic group, had requested information disclosure on the usage of the national budget in the 20th National Assembly, but the parliament has rejected the request. 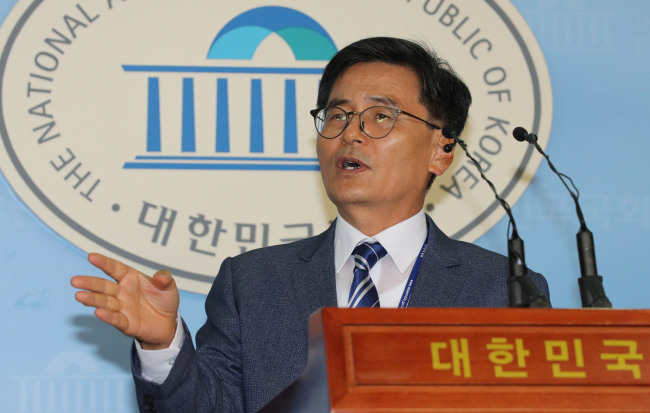 In a suit that followed, the court ruled in favor of the civic organization and ordered the Secretariat of the National Assembly to disclose the information in July, but the parliament decided to appeal the decision to “earn more time,” according to spokesman Lee Gye-sung. As for the past spending by lawmakers in the 19th National Assembly, the civic organization received the data only in June this year, after the Constitutional Court made the final ruling -- three years after the organization first made the request of information disclosure in 2015. It was revealed that a total of 24 billion won had been distributed to lawmakers, like “extra salary,” and there was no information on whether the funds for used for proper causes.